The conference then proceeded with its scheduled Session 4, Developing Economic and Energy Tools to Aid Farmer Decision-Making a few minutes late. Jennifer Colby, Program Coordinator of the Vermont Pasture Network at UVM, Colchester moderated this session. She introduced Dr. Eric Garza, who gave a presentation entitled Energy Life Cycle Assessment in Food Systems. Efficiency is improved when the least cost means achieves the ends one wants to achieve, or the means that delivers the greatest ends value is employed. Using the grazing animal as the means to harvest forage, if done well through well-executed grazing management, can be very efficient. Very little direct energy is used to feed livestock this way. In cold climates, this means is restricted by the length of the grazing season. If the grazing season can be extended through other means by growing forage crops that are cold tolerant or forages that retain their forage quality well past the growing season (stock-piling), this increases the efficiency of the grazing means of harvesting forage. More meat or milk is produced by this means before switching back to feeding conserved forages that require fossil fuel and indirect energy inputs to harvest, store, and feed them. This second order EROI analysis has been selected for use for the CIG project. It includes indirect energy inputs that the first order equation does not. For the purposes of the CIG project, the energy output is food in the form of meat or milk and other dairy products, or food = fuel. In the US, it takes a lot of direct and indirect energy inputs to produce food since agriculture is mechanized and uses a lot of fossil fuels, principally natural gas to produce fertilizers, primarily nitrogen based ones, and pesticides as well as fuel to grow and harvest the crops. Indirect energy inputs include energy required to design, build and maintain structures, machinery, vehicles, and to produce other inputs such as fertilizers and pesticides. However, besides agriculture production, many of our foods are highly processed, transported long distances to reach consumers, ready-to-eat, and come in a lot of packaging making it even more energy expensive for the fuel (energy) we get out of the food. Add dining-out, and it gets worse. The break even point is to have an EROI of 1. However, into today’s society and the burgeoning population, a lot food needs to be produced regardless of the energy expended to produce it and make it convenient for the busy or culinary arts disinclined consumer to purchase and consume it. If we look strictly at agriculture’s use of energy to produce food or fuel for our bodies, the energy return on investment can be improved through good grazing management on a grass-based farm. We can reduce direct energy inputs considerably. The growing of legumes on pastures or in rotation with row crops to produce symbiotically produced nitrogen in lieu of applying inorganic nitrogen fertilizers on these fields would greatly reduce the need to use natural gas (indirect input) in the production of inorganic nitrogen fertilizers and all the diesel fuel to convey the fertilizer from the factory to the retail outlet then to the farm and then apply it on the farmland. Energy costs for producing biofuels for all producers in Vermont presented next to energy costs re-ported in Pradham et al. (2009) - USDA column. “Liquid fuel” includes gasoline, diesel, and biodiesel fuel. “Other Direct” includes electricity, natural gas, propane, and human labor. “Other Indirect” includes the embodied energy of buildings, vehicles, oilseed presses, seed, and human labor, except for the USDA analysis does not include the embodied energy of human labor. “Reagents” is dominated by the embodied energy of methanol, but includes all reagents involved in transesterification (chemical reaction producing biodiesel from vegetable oil). 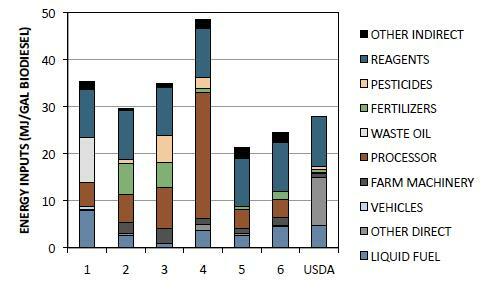 The above graph shows an energy audit for biofuel production in Vermont compared to a USDA study. This same type of energy audit would be used in the CIG project on grass-based farms. It utilized the second order EROI analysis since it included indirect energy inputs. Second order EROI analysis is much more expansive in its scope than first order EROI analysis since it includes indirect energy inputs or costs while first order EROI analysis does not. Indirect energy costs are challenging and tedious to estimate, but their inclusion makes the final EROI estimate more reflective of the real energy costs of a fuel (food). However, estimating indirect energy costs can also increase the uncertainty in the final EROI estimate. Tertiary EROI analysis expands the scope of analysis even further, looking beyond merely energy inputs. However, this introduces uncharacterizable uncertainty into the analysis and should be avoided since these non-energy inputs have to be translated in energy units, an imprecise exercise. It would also drive up the cost of the analysis considerably.